Gavin Rossdale opens up about heading out on tour and role modeling for his boys. 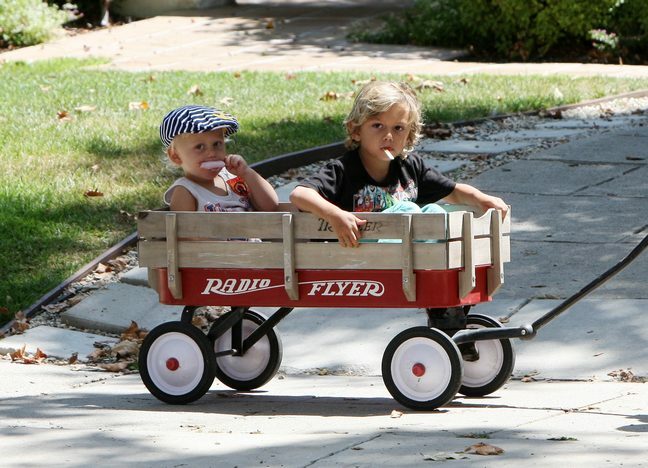 Gavin has two sons with wife Gwen Stefani: Kingston (4) and Zuma (23 months). He talked with Spin magazine about reuniting with his band, Bush, and heading back out on tour. He says that it's important for his boys to know how you have to work to earn the things you have, like the house they live in. "It's always painful when I leave on tour. It's the hardest thing. It never used to be difficult — I just had my dog and that was it. Now it's not easy, but it's reality. I want to set an example for my kids. I say, "Look at this house… this is how you get it." I don't understand the idea that you're unable to do both. People have done it for a long time, and you find a balance. I'm not going to be one of those dads who are always away and doesn't have any contact with home. I'm the opposite. I like that nomadic lifestyle and bringing the kids along is cool — they love it." Gavin kicks off his world tour with Bush in September and their new album will be released in October.